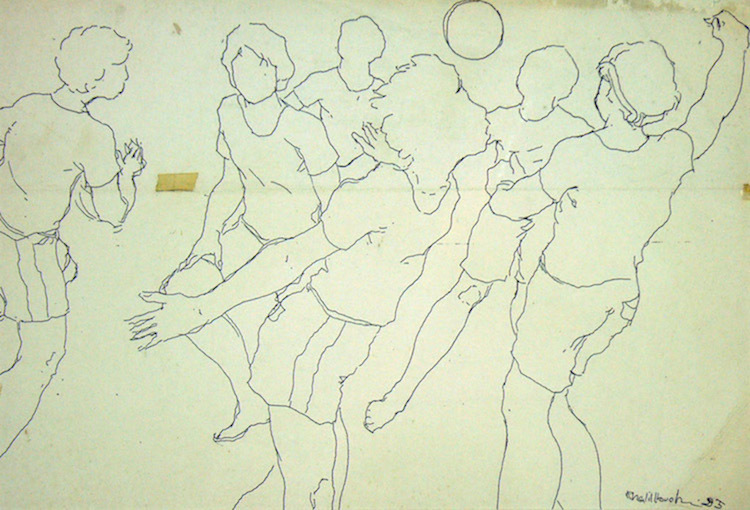 We are able to catch a glimpse into Khalil Ibrahim’s skillful sketch of ink on paper, a scene of a group of people absorbed in an entertaining game of netball. Devoid of facial features, the boys are seen hanging about each other. The soft, worn paper reminds us about familiar sport-scenes which brings nostalgia. Khalil had originally planned on going to Bandung, Indonesia, to further pursue his studies in the arts but his application wasn’t successful. That didn’t set him back one bit as it was during this period that the artist was first introduced to the District Officer, Claude Gibb Ferguson. With the guidance of Ferguson, Khalil studied English at the Clifford School, Kuala Lipis to gain the necessary language skills for him to continue his studies art in England. Khalil was sponsored by the Pahang state government to continue his studies at the prestigious Central St. Martin’s School of Art and Design in London.